Seems to work fine when running Windows 3.1 in DosBox (including music, but not SFX, though that's probably because there's something wrong with the SB drivers I used). 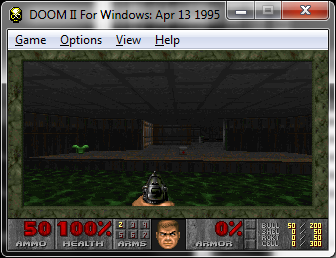 I can only suspect that doom is in fact using direct sound or the audio in a fashion that Win32s simply cannot do. I should check my basement if I still have the Windows Wonder CDs – I remember installing an X-Files screensaver that used WinG from there. BTW, can you upload the Lemmings demo somewhere? I even added a quick post & download for Lemmings if this one doesn't appear right…. Sure enough it is! I never knew there was a native port to the PC..
Wail32 seems to be this AIL, which looks like it eventually became the Miles Sound System. Do you think you could post or link to the actual driver you’re using? After having tried many of them, I’m quite sure at this point that you’ve got something pretty unique and useful. I’m guessing This is it?.  You’ll get a 404, but read the 404 for the username password as they are auto generated. 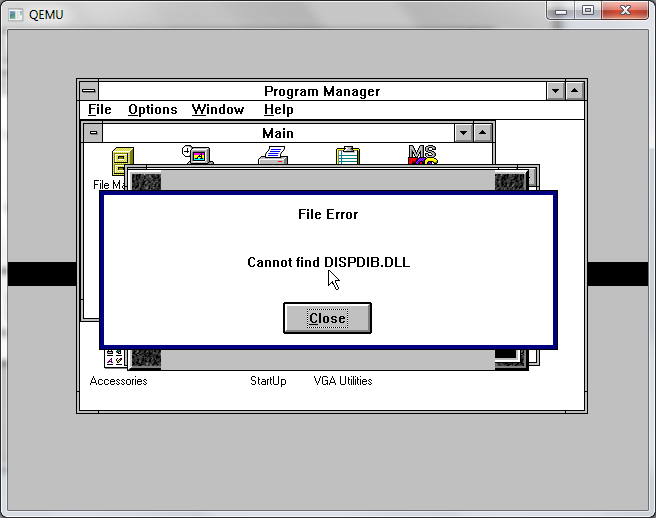 Thanks for all the help, but I’m getting “Error loading cirrus.drv” when Windows starts with this one. Also, I’ve noticed that not only with this driver, but also with a lot of the other Cirrus drivers I looked at while searching, there are no monitor frequencies supplied for any model of monitor (all frequency pulldowns are blank). 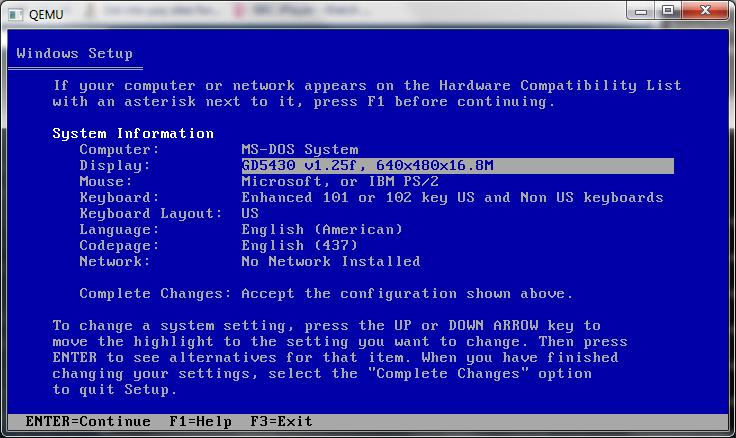 It seems like some of the versions have that and some don’t, and the ones that don’t have any refresh options to choose from won’t even start Windows when the guest reboots. (That’s what I’m seeing with this one.) The ones that do supply a list of monitor frequencies for the pulldown menus usually will let Windows start, but the display is corrupted. 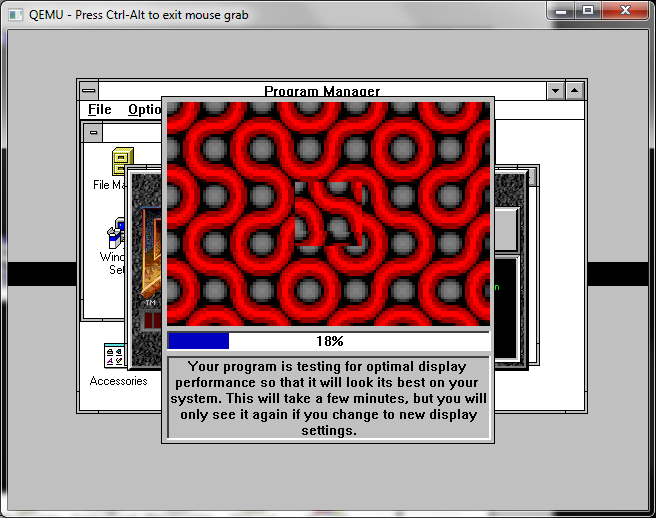 For what it’s worth, I’m running QEMU 2.10.1 on Linux. It’s ok if you don’t have any more ideas, because at this point, neither do I.
It’s probably the video settings… the older qemu got, the less it cared about preserving anything regarding older system comparability. 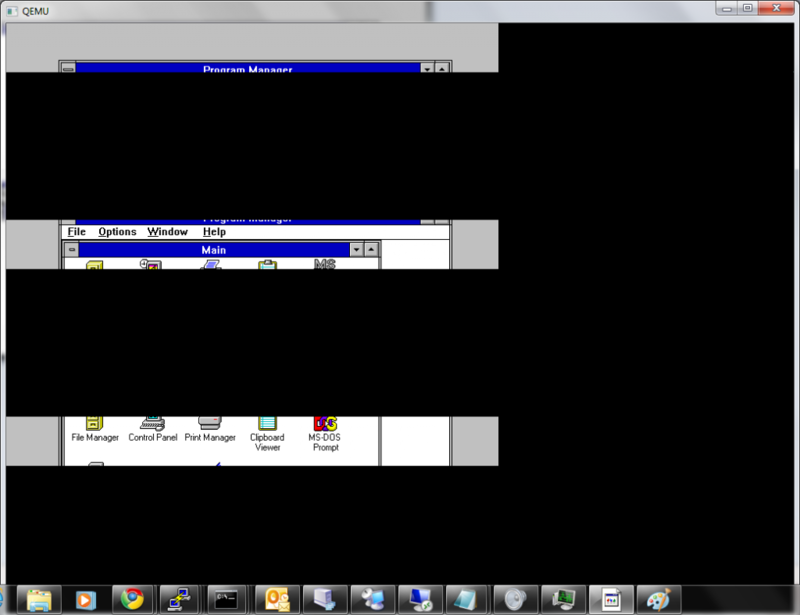 Granted I’m using Windows, but this ought to run on Wine I’d imagine. 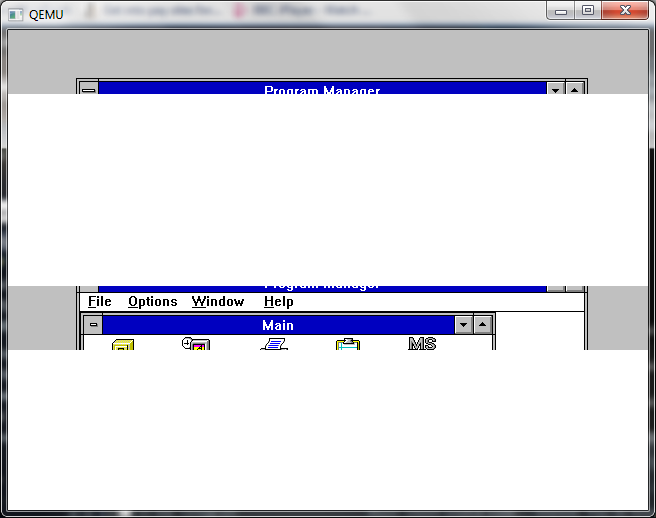 This is version of Qemu 0.90 that I’ve been messing with. Mostly to tell you as you run it what it’s doing. It’s all GCC 3.45 built so it ought to be old enough to be stable. Qemu 0.90 was the last real great version before the GCC people messed up Qemu. 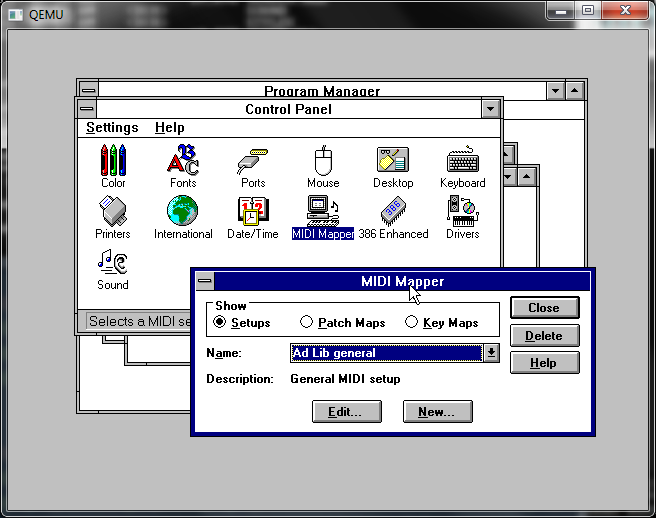 The reason I’m doing all this old platform emulation is because I never want to give up my old MIDI/studio software. I more or less collect audio/MIDI tools on DOS, Windows 3.1, WIN32, MacOS, Commodore 64/128, Amiga, Atari, and I’m on Linux natively, and I try to have all the tools (toys?) available, in emulation if possible, but also actual old hardware is an option as well with its own problems and advantages. Basically, I’ve gone off the deep end with this. If it was only about the music, it would be crazy, but I like the production process enough that for me it’s also become about how the sausage is made. Anyway, it amazes me that QEMU made this Cirrus emulation with the specific intention of being as compatible as possible, and it’s actually evolved into the finickiest video chipset real or virtual that I think I’ve ever seen anywhere. In WIN16, nothing will satisfy it. How compatible is that? It’s always been anything but really compatible. I’ve found that setting the chip to a lower version, and using an actual ROM helped a LOT when it came to emulation but when others have found issues with the emulation patches have been rejected. Just as when the IDE emulaiton drifted out of working with things like netware and nextstep there was zero interest in trying to address them. Qemu is just being used as the emulated hardware base for KVM to run Linux… It’s basically it’s entire reason for existing at this point. Newer doesn’t meat better, the older versions were in many ways not only more compatible, but significantly faster. You just need GCC version 3 to build them. Instead of using ‘-vga cirrus’, I tried for ‘-vga std’, and used the patched version of the Microsoft 256-color SVGA driver, just as I had done previously to get 1024×768/8bit in DOSEMU. It worked! The thing that disturbs me though is, I’m certain I did not neglect to try this before. In fact, the original post mentions doing this, so if I’d forgotten, this post would have reminded me to try it. And I’m sure I actually did, and it failed, just like it did for the OP author. I’m sure of it. So now I went back and tried it again, and now it worked. It’s pretty slow — you can actually watch the screen draw lines and paint windows, just like with QEMU’s vanilla VGA, so it’s probably not going to be fast enough for many games. But without the driver, you’ve got 640×480 in 16 colors, and with it, a decent 1024×768 in 256, so it’s an improvement if only to have a big enough desktop that File Manager is comfortably usable. Run QEMU (even a modern version) with ‘-vga std’, which is now the default, so on a new version you can leave -vga unspecified. Patch SVGA256.DRV, install, and behold Windows 3.1 at 1024×768…still drawing pixels really slow, but at this point, I’ll take it. 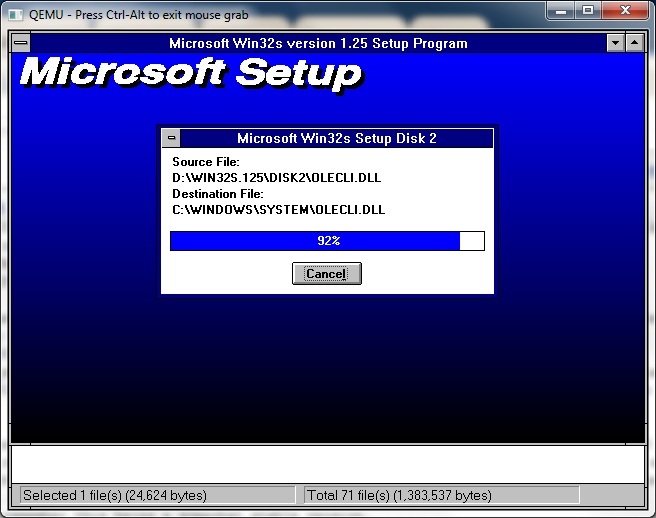 I think it comes down the to the version of Qemu. I’ve been messing with the source, trying to add some other port mapped devices, I’d like to eventually take some other emulators video emulation and incorporate those… baby steps first. 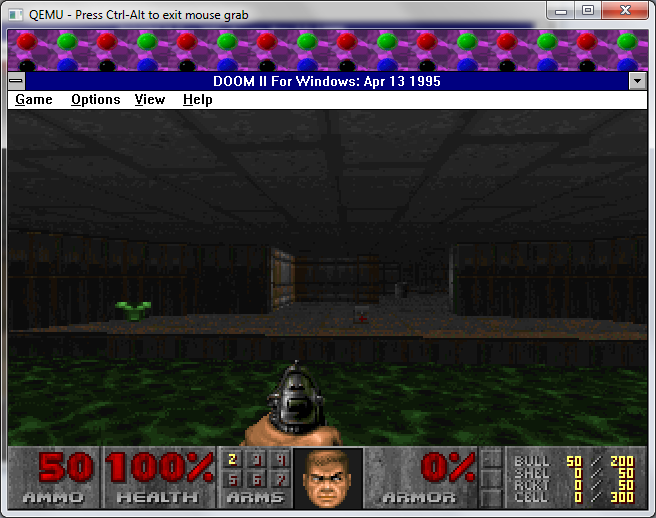 Previous Previous post: Doom source code..